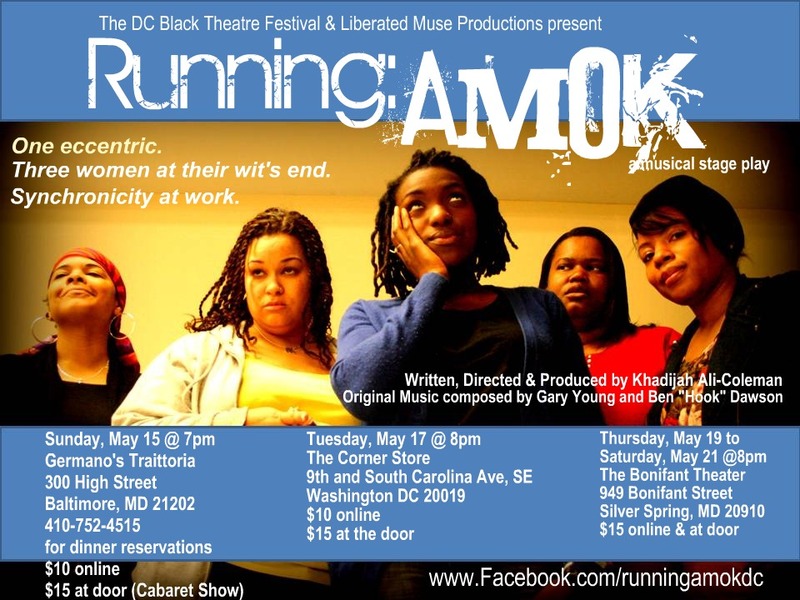 The cast of Running: AMOK presented a rousing performance in a cabaret-styled show at Germano’s Traittoria in Baltimore, MD on Sunday, May 15. The performance kicked off the Spring season of the 2011 run of Running: AMOK. And, the cast of Running: AMOK would like to extend a thank you to DC Urban Arts Examiner Tiffany Beard for her series this past month on the play and weekly Q & A features on the cast. Finishing up the series is this Q & A with returning cast member Quineice who plays LESHELL WOODS in the play. Here is a snippet of the Q & A, but be sure to visit Tiffany Beard’s Examiner page for all of the articles on the talented Running: AMOK cast. 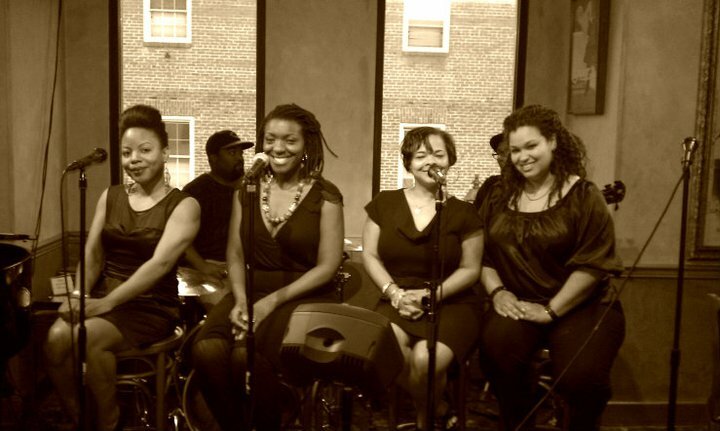 Quineice– I met Khadijah about nine years ago when we were in the short-lived band Phreaknahdo. We have been friends since then, so I was excited when she launched Liberated Muse. T– I am also a member of Liberated Muse, so I understand how exciting it is. Are you heavily involved with some of those happenings? Q- Liberated Muse is a great networking resource for artists. I have had the opportunity to participate in many events; such as promotional events surrounding the release of the anthology Liberated Muse Volume I:How I Freed My Soul. T– Were you born with the artistic bug? Q– I have been singing all of my life. I come from a musical family, so I dabble on many musical instruments. As for acting; I didn’t really begin honing my acting chops until recently. I had given up the idea of becoming a recording artist and decided to audition for a production of Dreamgirls given by a theater company in Baltimore. T– Considering that Dreamgirls is a musical, I don’t think you gave up your dream, completely. How did your audition affect your artistic path? 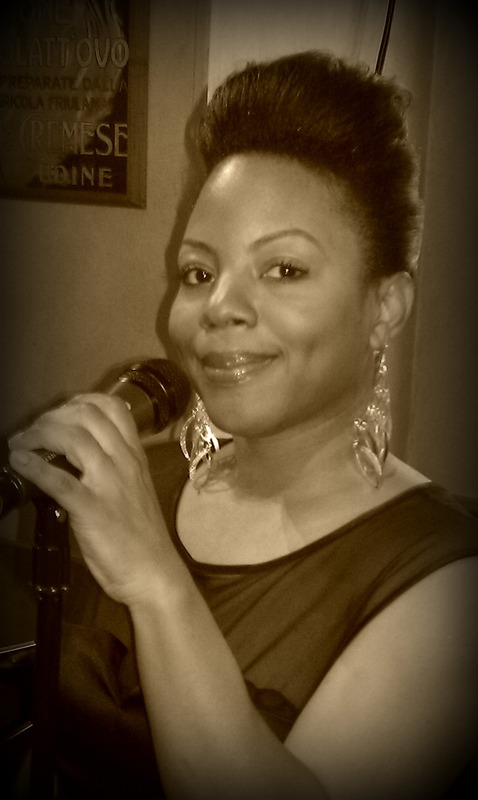 Q- I portrayed the character “Michelle” (the one they snuck into the group) all of the singing, dancing, costumes and music caused me to catch the “acting bug”. I went on the portray “Dorothy” in The Wiz, “Ronette” in Little Shop of Horrors and now “Leshell” in the original production Running:Amok. T– As busy as you are with your art, is it easy having the arts as an income stream for you? Q- I have to work to supplement the income that I receive as an artist. Unfortunately, I have not been able to quit my day job, because I have a family to support. Performing is something that I am passionate about, and if I could still eat and keep a roof over my head I would perform for free for the rest of my life. However, that is not my reality.